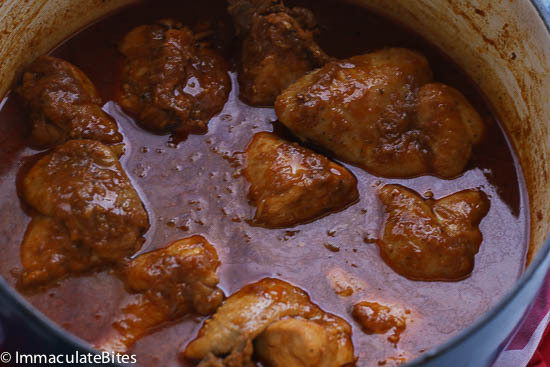 Doro Wat -Ethiopian Chicken Stew -slowly simmered in a blend of robust spices. Easy thick, comforting, delicious, and so easy to make! Fall is here, and with the arrival of the fall season, it seems that everyone robotically switch over from salads and iced drinks to more warm, comforting foods. I’m super excited to be getting into heavier fare with you guys. I love salads and all the fresh produce that hails from the summer months but nothing gets me in the right mood like stews, casseroles and baking. Am going to be honest with you and say in my household, my taste- buds dictate the season. Always have. Just a culturally thing, I guess. Meals are not seasonal well, maybe, celebratory events .So I have been happily trying this out during the summer months and now that it is the right season here. Am all ready to share my love of this stew with you guys. You can tell by the different parts of chicken I used- whole chicken, chicken thighs and legs that I really have been enjoying this. This version of Doro Wat aka Doro Wot is true to authentic roots, it’s easy to put together and packed with robust flavors from the spices. Berbere spice mix here and spiced butter here add great dimension to the dish and an incredible depth of flavor. 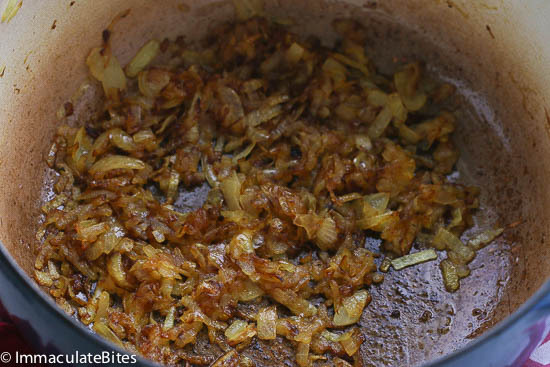 And OOh, the caramelized onion packs a PUNCH. Really does!!!! Folks! 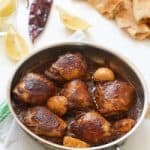 This Spicy Ethiopian Chicken Stew is African comfort food at its best, and believe me, it’s a winner! A great introduction to Ethiopian cooking. And the best part is…. I got you covered with the spice mix(Berbere and spiced butter).Your girl is looking out for you! NO EXCUSES! Just in case you do not have an Ethiopian market next to you or don’t have spice mix available. 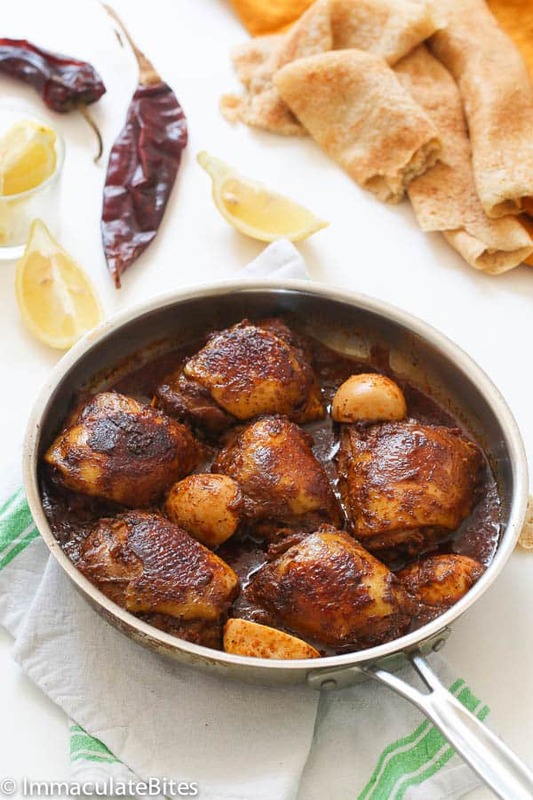 Now take a sensory vacation to Ethiopia with this Chicken Stew, Ethiopian Greens, Stewed lentils(Mesir Wat) and this Delicious Injera here to soak up any all the juices from the chicken. 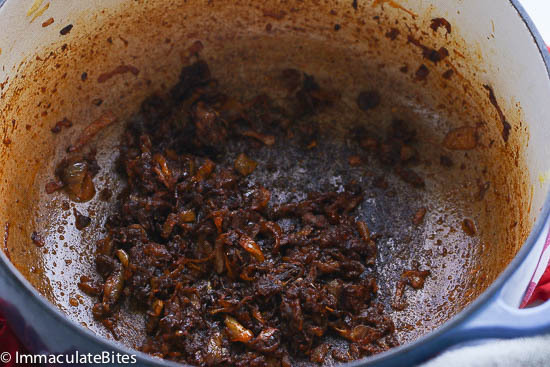 In a large pot, over medium heat, heat until hot, and then add spiced butter and onions, sauté onions, stirring frequently, until they are deep brown about 7 -10 minutes. 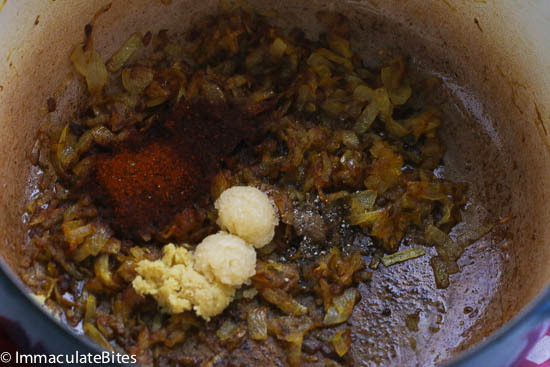 After the onions are caramelized or reached a deep brown color, add some more oil, followed by berbere spice, garlic, and ginger. 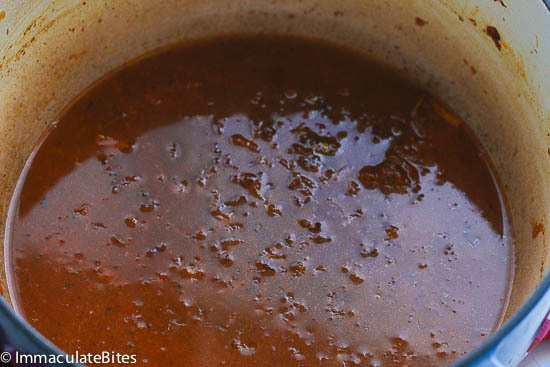 Adjust sauce thickness and seasoning with water or broth, lemon,salt according to preference. 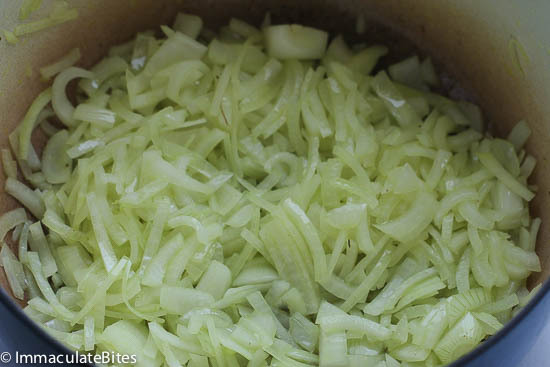 Place a large pot(preferably non-stick) over medium heat, until hot, and then add spiced butter and onions, sauté onions, stirring frequently, until they are deep brown about 7 -10 minutes. Be care not to let them burn. Desired color you are aiming for . After the onions are caramelized or reached a deep brown color, add some more oil, followed by berbere spice, garlic, paprika and ginger. Mixture should have a really deep rich brown color. Again , be careful not to let it burn. Then add about 2-3 cups water . Finally add eggs and squeeze lemon juice (lemon juice is optional) or reserve and serve on the side . 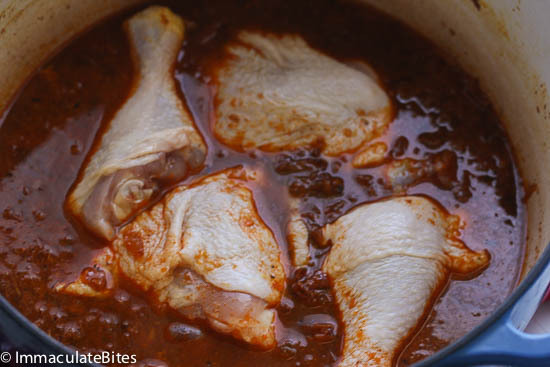 Let it simmer for about 10 minutes or until chicken is tender. Remove from the heat and serve warm. My son (who is Ethiopian) and I made this last night, and we LOVE it! Thank you! 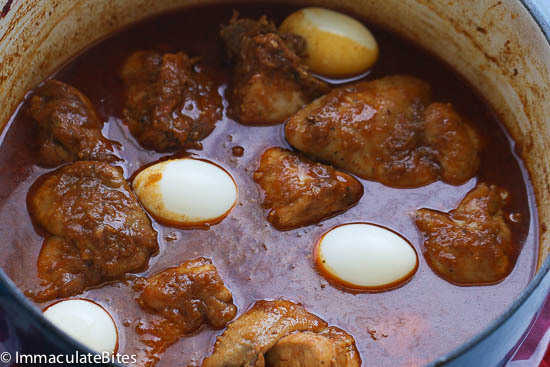 I have been looking for a good Doro Wat recipe for years and now I have it! I’ve been making Ethiopian food for many years after enjoying it in restaurants in Minneapolis, New York, and Harrisonburg, VA. I put a little sumac powder in my Doro Wat, maybe 1/2 teaspoon. It was just astounding. It also helps the flavor of the eggs if you hard boil them and pierce them gently with a fork just before you add them. Great job Imma! I had this dish in Asmara, Eritrea and there are 2 things I really miss. Eating this in Africa is a much more social event since diners all gather around and share from a single plate with a large injera under the stew. Talking, laughing and sharing! Next, I miss the injera which i have not found to be as good in the US. 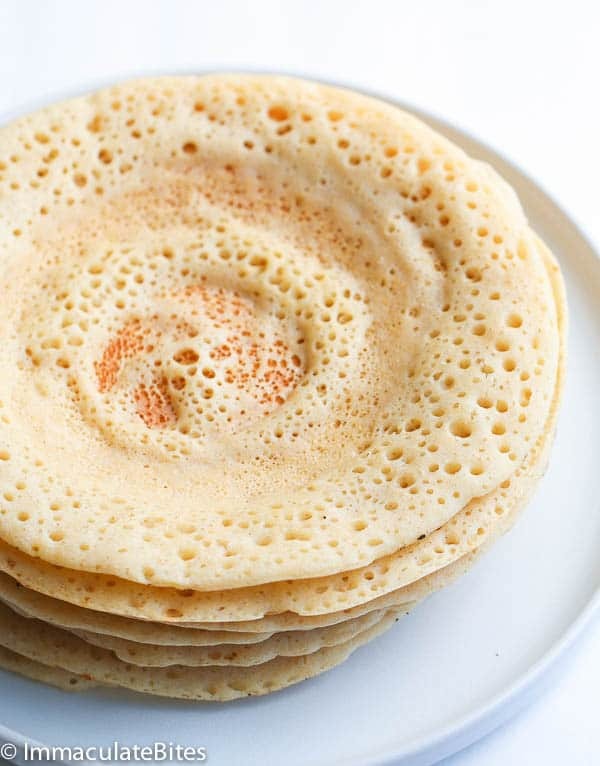 I remember an injera grayish in color and resistant to stretching so when you pull on it it tears. The best description of the taste is nutty and it held up to the sauce without getting soaked. Also, my comment is that there is no wrong or right way for this dish. I’m sure every Ethiopian granny has her own way to spin the dish and out in the country if you run out of a spice well, you do without until the next chance to get some. I implore you Imma, please look into my injera! I can’t be the only one longing for this. I am very anxious to try this recipe as well as the injera. I have had both in African restaurants and so excited to try them at home. My husband is a vegetarian but I love my meats. With this stew, we both can have what we love to eat. Going to make your recipe for Collard Greens in my new “Insta Pot” so I can cook fast and easy whenever the mood strikes. 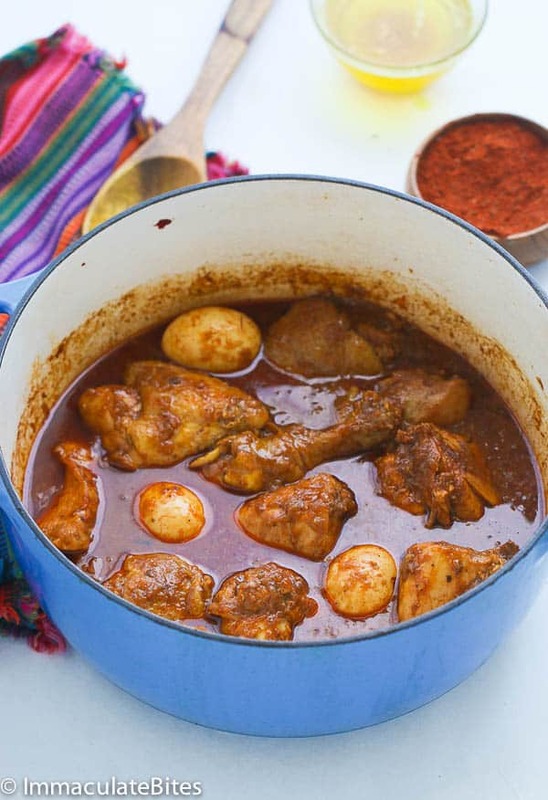 Thank you for this (and other) African recipes. HI, I was reading through the recipe to see where everything comes together, and I couldn’t see where the lemon is added. So is this a mistake or did I not read correctly? Thanks. It’s been updated. Thanks for bringing this to my attention. Hi, thank you for fixing it. This dish was absolutely delicious. I made it to accompany misr wat, injera, and collard greens. It was so good. Thank for the recipe. You’re most welcome, Tristanio. Thank you for trying it out and for stopping by. I appreciate it. I’m curious why add spices that are already in the berebere spice mix. To add additional flavor. You may experiment with it – or add a little at a time. Sometimes a spice that is toasted brings a very different flavor to the mix than that same spice that isn’t toasted. Thank you very much for great recipes on your site. We’ve made spiced butter, Doro Wat and the spiced green, and sat them on a homemade naan. Great meal, and the Doro Wat sauce much tastier the next day when aggressively reduced down. In fact, I now realise that 3 cups of water was too much – I should have used two, and left the pan uncovered to reduce. Will definitely make again, thanks. That’s great to hear Tony. Thank you so much for the feedback!! I made this tonight and it was absolutely amazing. I seared off the skin side of the chicken thighs before proceeding to the onions. A little red wine was added at the end ala Marcus Samuelsson. It was served with the cabbage, carrot, and potato dish along with naan brushed with the spiced butter. Phenomenal! Thank you! Oooh! I love your variations Amy, YUM! Might inspire me to make a variation with wine. Thanks for sharing!!! Delicious recipe! Made this tonight. The smells in my house are fantastic. I am from Europe , my boyfriend From Ethiopia . So I made this just to remind him of home . End up being very tasty and easy to prepare . Will make this again . Thank you . Your pictures are great and inspiring food ideas . Thanks Marina! So glad to hear it worked out well for you. Thank you , it looks great . I want to try this recepie today . Thanks! I use lemon to add to the stew towards the last 5 minutes. It’s optional. Adjust to taste. Hi, Can you clarify what type of Paprika you use in this recipe… sweet, smoked? I usually go with smoked paprika because it is slightly flavorful than the sweet one. However, any would work. How much of a kick does this have? I could not find fenugreek seeds for the life of me, and the only spice I use regularly is chili pepper… if I love spicy foods, will the Berbere be enough, or should I add chili into the mix? Thank you! Indians Markets always carry it.The Berbere would be just fine. It sure has a kick to it . This recipe looks so delish, I’m so looking forward to making it. I feel like it’s probably right in front of my eyes, but I swear I can’t see spiced butter in the ingredients list and therefore am not sure how much I’m meant to be using, is it just enough to saute the onions? Heaped teaspoon, or two? Thank you! Amy, it’s not you. It’s me. Your eyes are PERFECT. Believe me, I have gone over this several times and just couldn’t see it. Yes, you add it as needed when you saute onions. I have updated with the amount used. Adjust would more or less. Thanks. Awesome! Glad you enjoyed it. The recipe for doro wot I was given originally has peanut butter in it. Are you familiar with this recipe ? From what I know most don’t include peanuts. I’ve never had Ethiopian food but am totally drooling over this. It sounds amazing! Thanks Olivia! It truly is. I have a recipe for the spiced butter, and keep looking at it and wondering just how and where I would use it. I think you answered that question! Hi Anne! It would work great in this recipe or with collard greens. Hi- what exactly is the recipe for spiced butter? I love doro wat, and look forward to trying this! Hi Rosemary! Here is the link to the recipe. Let me know how it works out for you. This recipe looks great! 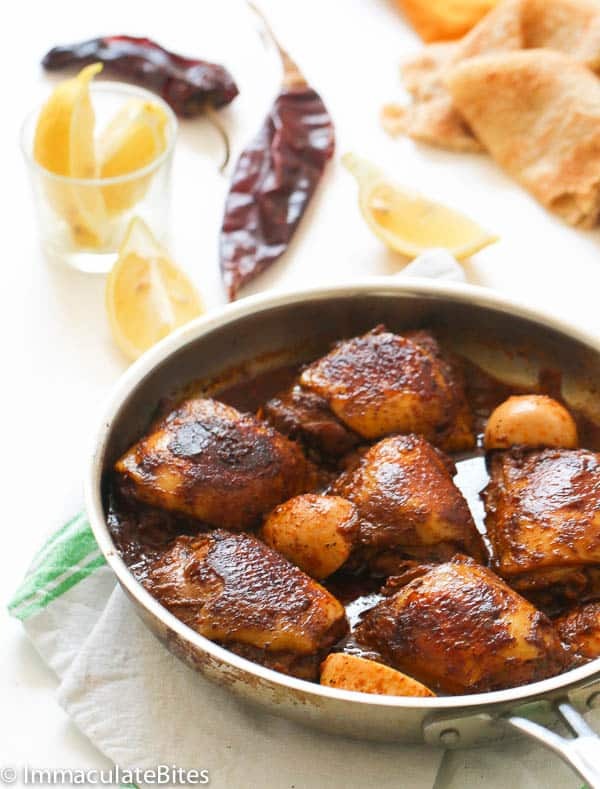 I love chicken cooked in this manner but have never used Ethiopian spices. I will definitely give this a try. Nice photos too. This looks gorgeous! I’ve never made or tried Ethiopian cuisine before, but my eyes are telling my stomach it’s high time to give it a go. Thanks for the inspiration and for sharing such a beautiful recipe! This looks awesome! And I’m totally with you in loving stews and casseroles — perfect in the fall. I have only had Ehtiopian food twice but absolutely loved it- especially the Injera – oh my so good. I’ve already got that recipe open to figure out how I can make the whole feast! Love this! Glad to have found your blog and am now going to start following you on social media too! Happy cooking! Hi Vicky! Glad to hear you love Ethiopian Food and are into stews and casseroles . Heading over to your blog to check it out and will be following your you on social media as well. Aww thanks Dalia! Glad you approve . It truly is a festive dish!! Hi Nadia , you are in a for a treat! Ethiopian food is quite flavorful. This looks so good! 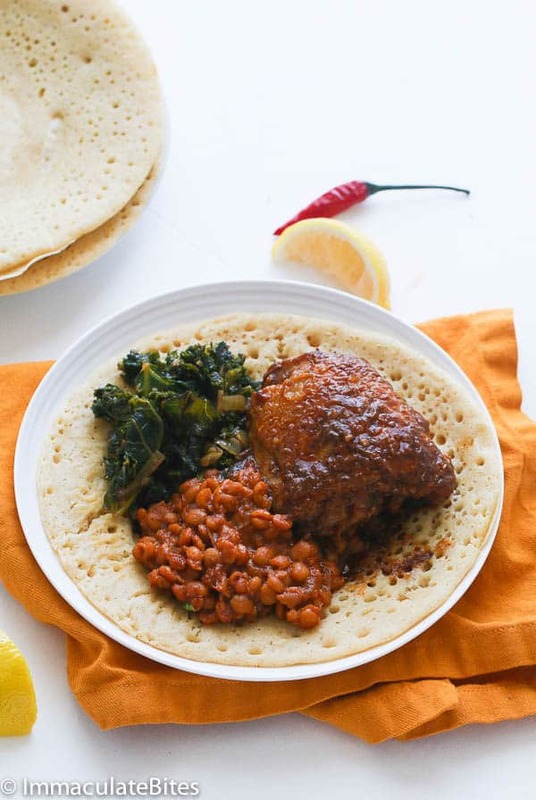 I’ve never tried Ethiopian food so I’m def looking forward to making this. I think I just died. The chicken and flat bread looks too good I say. Too good. Hi Noel! 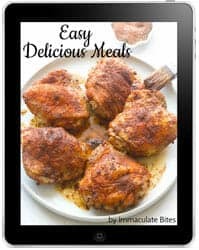 You can make your own Berbere spice mix using my Fabulous spice mix here https://africanbites.com/berbere-spice/. Most of the ingredients are pantry staples and the rest you can pick up at your local international market or Indian Market. If all fails use chill pepper and smoked paprika.